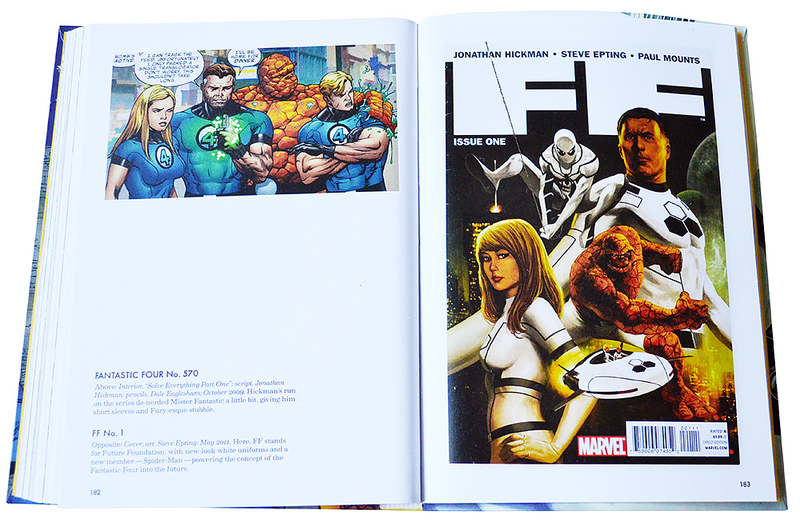 The Little Book of Fantastic Four (Taschen, 2017) | 'TAIN'T THE MEAT… IT'S THE HUMANITY! 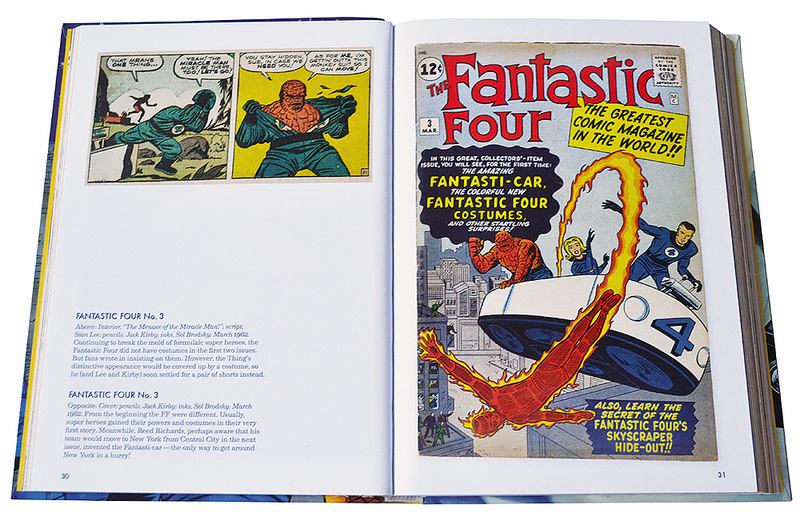 The Little Book of Fantastic Four is a small celebration of a very big comic book. The back cover to The Little Book of Fantastic Four. The first issue of The Fantastic Four was published by Marvel Comics in late 1961 and it helped usher in a new wave of flawed yet hugely relatable superheroes. Written by Stan Lee and drawn by Jack Kirby, The Fantastic Four quickly established itself as one of the most popular comic books ever published — it may not of been the first book of Comics’ Silver Age, but it certainly was one of the most influential. The adventures of Mr. Fantastic, The Invisible Girl, The Human Torch, and The Thing — ordinary people given extraordinary powers by an accident of nature — have captivated and entertained comic book readers for over 50 years, and in the process they helped make ‘Marvel Comics’ a household name. 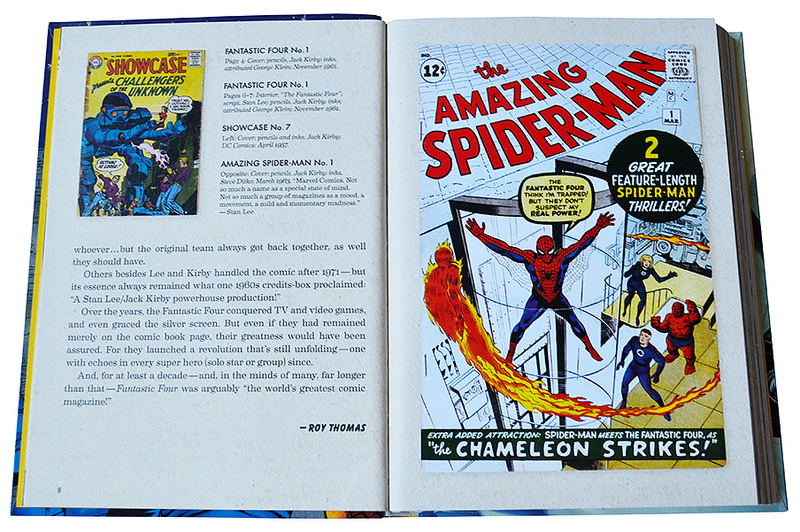 The Little Book of Fantastic Four, pages 8 and 9. 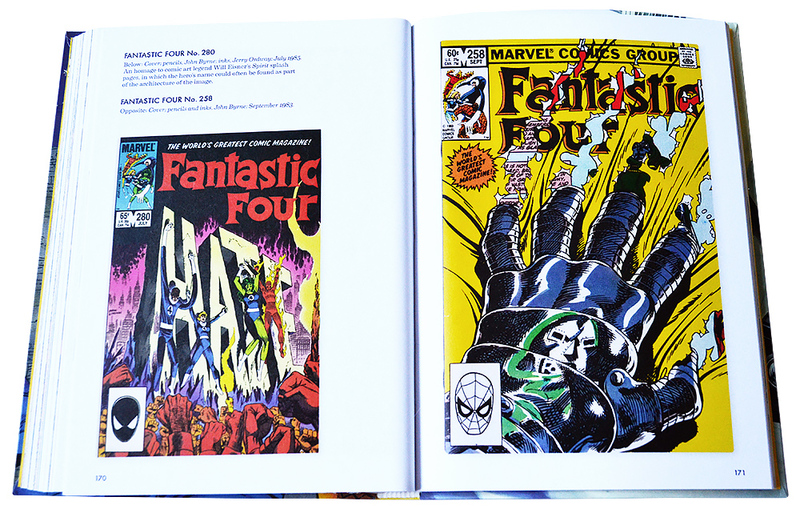 To celebrate this influential comic book Taschen has published The Little Book of Fantastic Four. 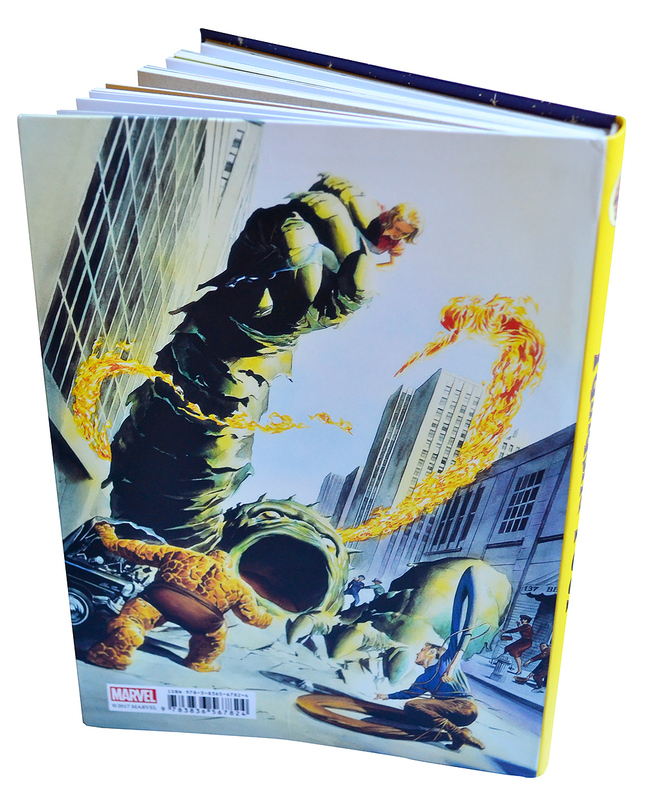 Written by former Marvel Editor-in-Chief Roy Thomas this hardback book measures a modest seven by five inches, and runs to 196 full-colour pages. The book features a compact yet surprisingly comprehensive history of the first five decades of ‘The Worlds Greatest Comic Magazine’. 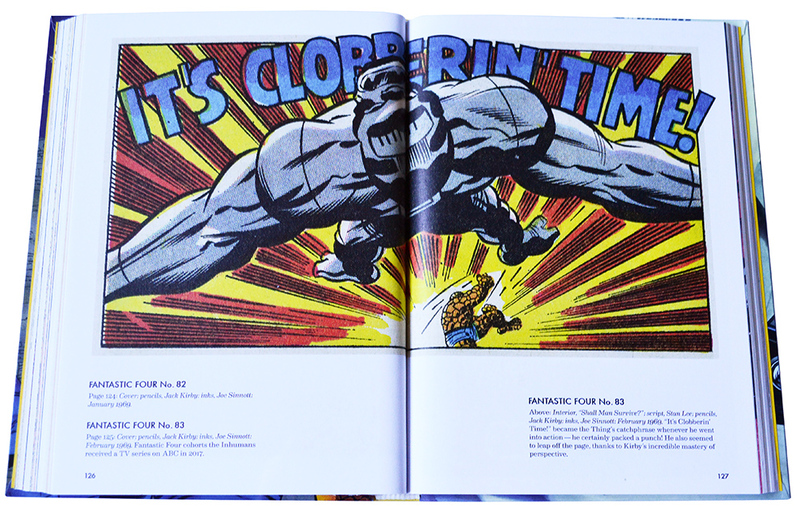 Along with reproductions of covers and internal pages from the comic, the book also features some of Kirby’s original artwork, licensed material, book covers and even some storyboards from the short-lived Fantastic Four cartoon from the late 1970’s (thankfully the awful live-action movies aren’t mentioned). There’s an introduction by Thomas (which for some reason has been translated into both German and French, even though the rest of the book is in English) as well as detailed captions that explain the history and evolution of the ground breaking comic book. 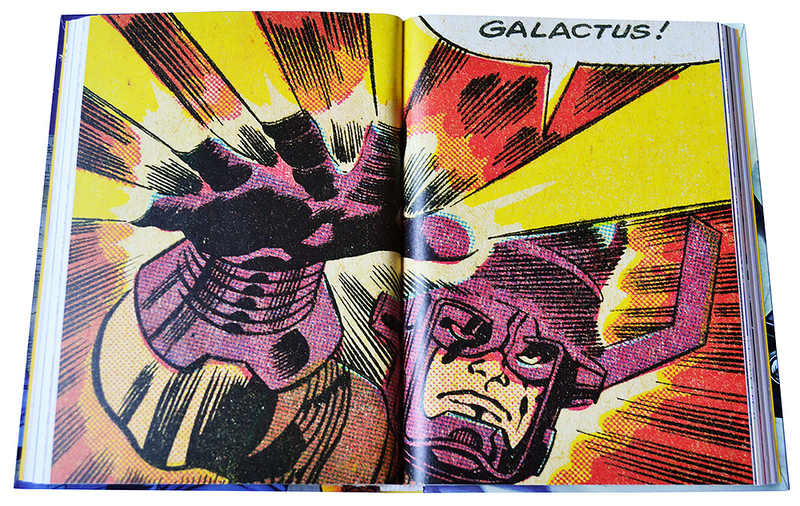 No book on The Fantastic Four would be complete without a look at Lee and Kirby’s groundbreaking Galactus trilogy from issues #48-50 (pages 84 and 85). Since Lee and Kirby’s run on the comic lasted for 102 issues it’ll come as little surprise that the bulk of the book concentrates on their legendary run. Thomas also highlights John Byrne‘s celebrated five-year run on the title in the early ’80’s, where the artist/writer successfully returned the characters to their adventuring roots. The book may be small on size, but it’s big on impact (pages 126 and 127). Thomas’ extended captions are both informative and entertaining and it’s obvious The Fantastic Four is close to his heart — hardly surprisingly since he inherited both the writer’s job on the comic and Editorship at Marvel after Lee in the early 1970’s. 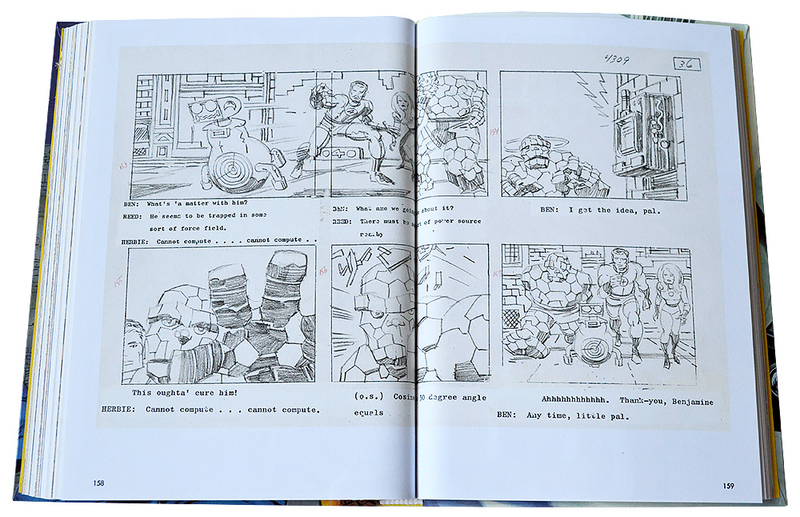 Some storyboard layouts from the short-lived Fantastic Four cartoon from 1978 (pages 158 and 159). The book is printed on bright white paper stock that really does justice to the reprinted art. And the design is both clean and uncluttered, which allows for the artwork to really shine despite the books’ diminutive size. The cover also features spot varnish on the logo and on the FF themselves — a nice touch. John Byrne’s celebrated run on the title is well represented, including some of his more innovative covers (pages 170 and 171). The Little Book of Fantastic Four may be small in stature but it’s an entertaining read nonetheless. Life-long comic books fans — such as myself — will enjoy revisiting those classic old stories, particularly those from the Lee/Kirby period. And new or casual fans will find this an entertaining introduction to one of the most influential comic books of all time. After reading the book I can’t help but feel that a bigger, more expansive study of the FF is in order, perhaps one that looks at the entire history of the team in even greater detail. The book also includes more modern takes on the team, including Jonathan Hickman’s recent run on the comic. 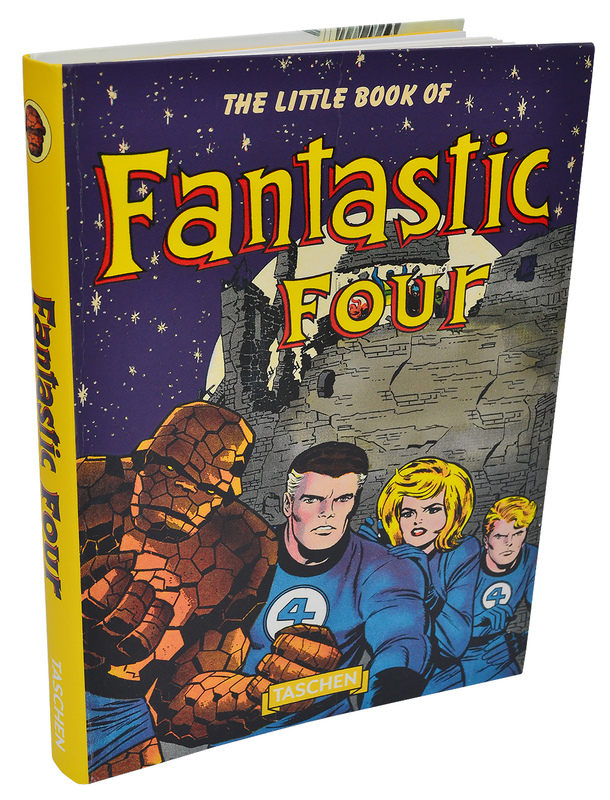 Thankfully, due to its small size The Little Book of Fantastic Four comes with a small price tag — I picked up my copy for under a fiver, and for 196 full-colour pages that’s a real bargain. The book is a thoroughly entertaining read and one that would make a great Christmas stocking filler for either diehard or casual comic book fans alike. Taschen have also published three other Little Books featuring Marvel Comics superheroes: The Amazing Spider-Man; The Avengers and Captain America, all written by Roy Thomas. There is also a selection starring the big three from DC Comics: Superman; Batman and Wonder Woman, written by Paul Levitz.